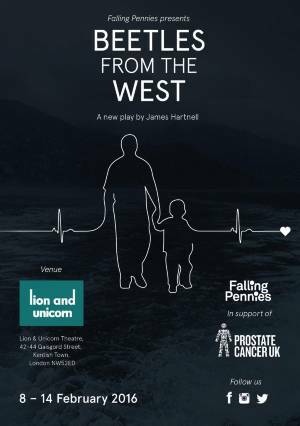 It is a treat to go and see a fringe theatre production which bravely confronts important issues that may fall beneath the radar. This is the mission statement of founder of Falling Pennies Theatre Company, Ryan Penny, and in their debut production they have made a good start. 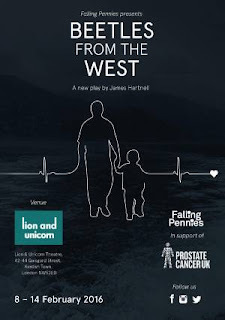 Beetles From The West follows Boyd (Ryan Penny) as he deals with his father's sudden admission to hospital. Accompanied by his girlfriend Jenny, (Amy Doyle) he is by turns obstinate, angry and disbelieving when the doctor (Matthew Marrs) tries to explain that the likely diagnosis is prostate cancer. The subject matter may make this a hard sell for some, though the actors approach James Hartnell's script with energy and enthusiasm. The protagonists are loud, brash and somewhat uneducated, giving voice to some of the misconceptions around the illness to amusing affect. Penny and Doyle play off one another nicely in these lighthearted moments and the first part of the play drew laughs from the audience. By contrast, Marrs' character is the serious professional, unsure how to react to the ignorance of the couple, but wanting to find a way to make a difference. His personal story - as victim of an abusive parent- adds depth to a character which could otherwise have been two-dimensional. We get some important moments of insight from the doctor - 'cancer is not a battle' - but the script doesn't become bogged down with these, as 'issues' plays are often wont to. The actors are skilled and make the audience forget the sparse set and focus instead on the message of the play. Boyd in particular, captures the essence of disbelief at his father's illness and conveys exceptional vulnerability as the play reaches its crescendo. His speech towards the end of the play, in which he expresses his lack of care regarding anyone else's suffering, struck me as an incredibly honest and powerful moment; there is an innate truth in human selfishness when it comes to losing those one holds dear. My main criticism is that I felt Hartnell lost the voices of his characters in moments, as they spoke more poetically than expected. I understand the reasons behind this but I felt there might be a better way to convey the same meaning in those strong brash voices he'd already created. As a director, Hartnell kept it simple and utilised the space well. Ultimately the play ends on a somewhat uplifting note and I left feeling it was a well spent 65 minutes. I hope readers might consider attending this interesting and challenging new production which runs until February 14th (buy tickets).